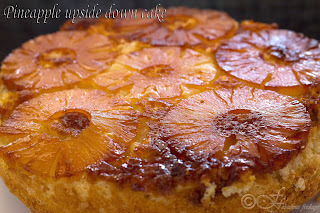 Here is an easy recipe for a delicious, super moist, homemade pineapple upside-down cake. This delectably sweet classic treat consists of caramelized slices of pineapple and a buttery white cake batter. I like using fresh slices of pineapple but you can use canned slices as well. Any sugar will work here but brown sugar adds an interesting taste especially when caramelized. As a variation add some pecans or walnut pieces alongside the pineapple rings, right over the caramelized sugar. The added crunch and nuttiness adds a whole new flavor dimension. 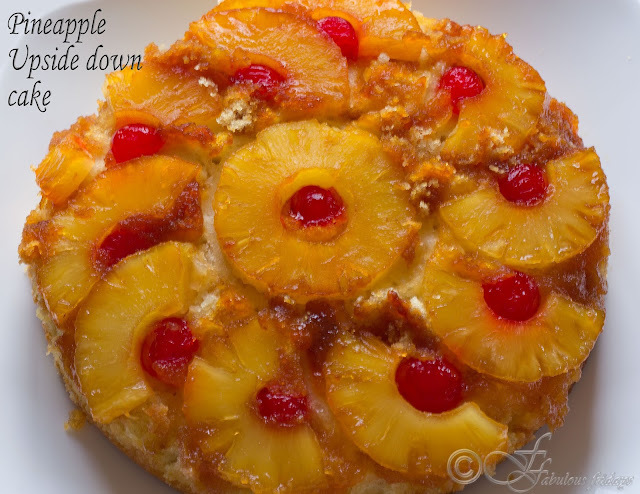 The combination of the rich buttery cake and caramelized pineapples creates a rich, luscious fabulous dessert. 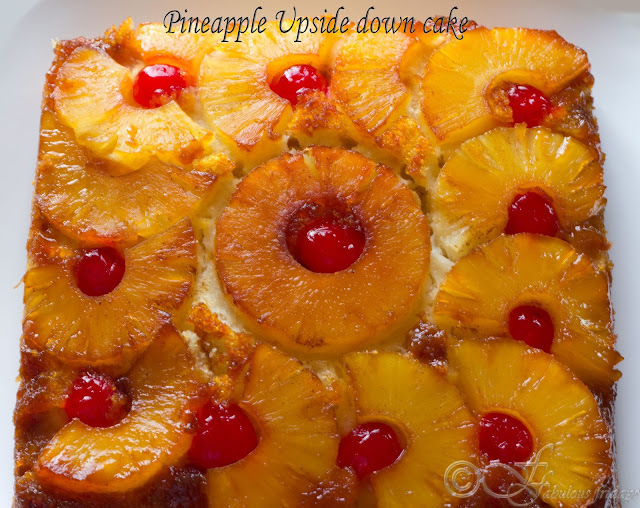 Serve it with coffee, tea or as a perfect ending to a tropical meal. To prepare the cake mix together flour, baking powder, baking soda, and salt. Set aside. Whisk together melted butter and sugar until soft. Whisk in egg, milk, lime juice and rind, and vanilla extract until combined. Slowly mix in dry ingredients until no lumps remain. The batter will be thick. To prepare the topping place the butter and brown sugar in a small saucepan and stir over medium heat until the butter melts and the sugar dissolves. Continue cooking (without stirring) for a few more minutes or until bubbles appear around the outside edges and the sugar starts to caramelize. Remove from heat, and pour into 9 inch round cake pan. Evenly arrange the pineapple slices on top of the sugar mixture. 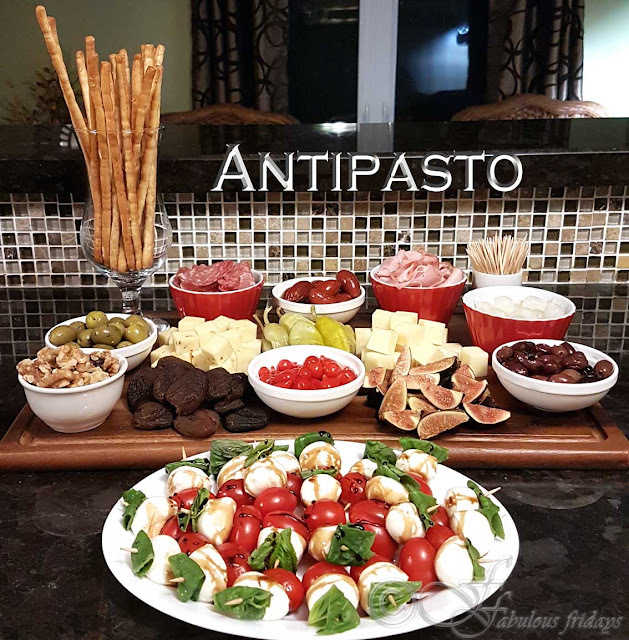 Can also garnish with cherries or pecans. Pour the cake batter into the prepared pan and bake for 45-55 minutes. Allow it to cool for 10 minutes on a wire rack. Run a sharp knife around the edge of the pan and invert cake onto a large serving plate. Slice and serve warm, room temperature, or even cold. Try serving with vanilla ice cream - it's a delicious combination. Cover cake and store for up to 3 days in the refrigerator.